I get questions from listeners on occasion, and I try to help them find answers. This question was the kind I like—the kind where I know the answer. “Do we have salamanders up here?” Yes, we definitely have salamanders here. It’s a fair question. Salamanders are a rare sight, unless you are in the right place at the right time. This was at a seasonal cottage, in late summer, and with all the rains we have had, it didn’t surprise me to get a report. It was probably in a basement, crawl space, or window well. I could guess that because those are the most common places where salamanders get themselves into trouble and can’t get back out. I even guessed what it looked like, much to the listener’s surprise: small, shiny and black with blue spots on the sides. The next question, no surprise, was whether it was dangerous or harmful. I replied no, it has no claws or teeth, so if they needed to handle it to move it they would be fine, but I said sometimes their mucous can cause irritation so wear gloves or wash hands thoroughly after handling. You may have already known that we do have salamanders, but most people don’t really give them much thought. Did you know we are actually a fairly salamander-rich state? In fact, we have seven species of salamanders here. Of those, only one (the four-toed salamander) is a species of special concern. The rest are considered common depending on what part of the state you are in. The mudpuppy is the only species that is fully aquatic throughout its life; most of the other species are aquatic in their larval stage, after they hatch from eggs, but become terrestrial air breathers as adults. Most, that is, except for the Eastern Newt, which can have aquatic or terrestrial adults. The eastern red-backed salamander is considered the most abundant Wisconsin salamander across its range, which is basically the northern half of the state. We have the spotted salamander, which is present everywhere except SW Wisconsin, and the blue spotted salamander, which is found in almost every county in the state. Finally, our largest terrestrial salamander, the eastern tiger salamander, which can reach up to 11 inches. The tiger salamander can be found in over half the counties of the state, absent from those in northeast and southwest Wisconsin. The name salamander is derived from a Greek word meaning fire lizard. Mythology holds that salamanders are mystical creatures that emerge from fire. 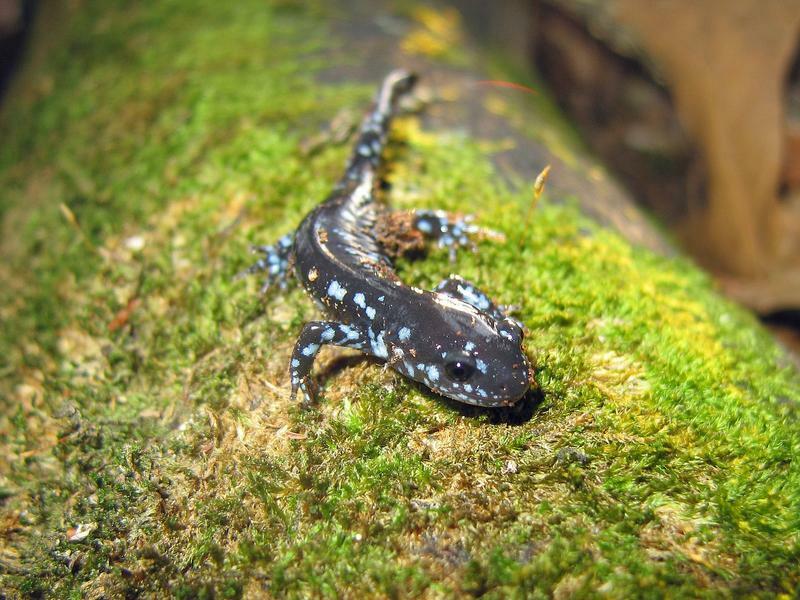 This could be because salamanders like to occupy old decomposing and rotted logs, which sometimes end up thrown in fires causing an evacuation of sorts. Salamanders are amphibians, meaning they are more closely related to frogs than lizards. They have wet, slimy skin, like frogs, and no scales. They breathe partially through their moist skin, so they have to find wet cool areas to reside, usually wetlands, streams, lakes, ponds, or decomposing leaf litter on the forest floor. Salamanders are capable of autotomy, meaning capable of self-amputation of a body part, specifically a tail, to escape a predator. In fact, they can lose a tail, a toe, or an entire limb and grow a new one to replace it in a couple of weeks. Like frogs, they eat insects, worms, small animals and snails. If you haven’t had the chance to see a salamander, you are not alone. With a need to keep skin moist, not being terribly fast on land, and not having much in the way of natural defense from predators, salamanders are understandably nocturnal. The best way to try to see a salamander is to be out near small wetlands or ponds on a rainy night in spring or fall. Otherwise, you can try turning over a large wet crumbling rotten log and see if you get lucky.